Large Heavy Duty Outdoor Dog Kennel Enclosure with Mesh Screen Shade Cover. Size: 10'L x 10'W x 6'H. What's in the box. 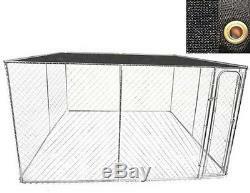 10'L x 10'W x 6'H Dog Kennel with Mesh Screen Shade Cover. Outdoor Chain Link Kennel provides a large enclosure for your dog or puppy of any size. Tube size: 1.25 x1.25 inch Steel galvanised tubing, completely rust resistant. Wire: Mesh size: 2.36 x 2.36 inch. Cage size: 10'L x 10'W x 6'H. Perfect way to run and play safely for your pets from dogs, chickens, rabbits etc. High quality and sturdy structure. Larger range of sizes available in our shop. Assembly will require two people with a knowledge of DIY, item comes flat packed. All listing descriptions as indicated above are based on manufacturers packing information. The only case to return the item is the defective or wrong item. All defective situations must be reported within 30 days upon receipt of the items.